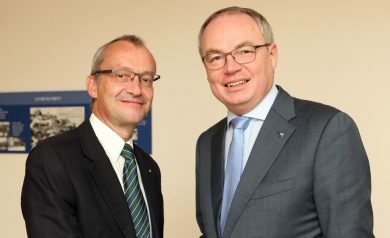 Deputy Governor Stephan Pernkopf visited the headquarters of the Müller-Guttenbrunn Group in Amstetten. Successes and necessary improvements in the recycling sector were discussed. Recycling is important, but it is also a true Herculean task. 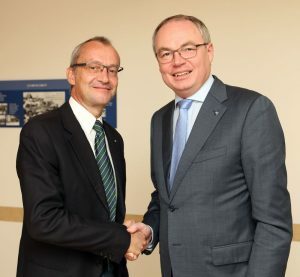 This was confirmed by Stephan Pernkopf, Deputy Governor of the Provincial Government, during a visit to the Müller-Guttenbrunn Group (MGG) in Amstetten. 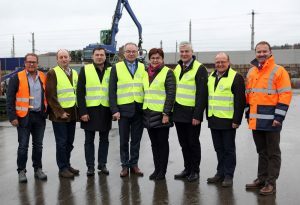 The company operates three plants in the Mostviertel, mainly in the recycling of end-of-life electric appliances and end-of-life vehicles. At the individual MGG sites, ferrous and non-ferrous metals as well as plastics from WEEE are recovered and recycled as secondary raw materials, closing the loop in the Circular Economy. In a short presentation, the company reviewed the successes of recent years. In addition to international awards, the data about the recycling processes in particular stand out: by recovering the raw materials, for instance, each of the 240 MGG employees in the Mostviertel companies saves more than 1000 tons of CO2 emissions per year – and that per employee! 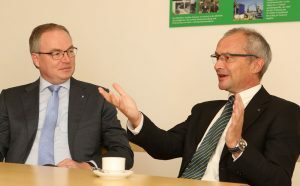 Deputy Governor Pernkopf was particularly impressed by the innovative strength of the Amstettner family-owned business: „It is wonderful to see the commitment with which all employees devote themselves to the topic of recycling. When you see that 95 percent of the waste can be recycled, it’s quite remarkable „, said Pernkopf during a tour of the MGG site in Amstetten. He was impressed with the large shredder installations and the enormous amount of development work that is involved in them. Managing Director Christian Müller-Guttenbrunn reported about the numerous modernisations in recent years – such as the completely new exhaust air system, weighing several tons, that was installed last summer, providing clean exhaust air since its installation. Through constant innovation, the Müller-Guttenbrunn Group has developed into a recycling company with an international reputation. As such, efforts are being made in Austria and on the European stage to identify potential for improvement in order to make recycling more efficient and cost-effective. One of the innovation projects that is currently on its way is the Bobby-car project, whereby solid plastics in the bulky waste fraction is collected seperately to be recycled. The project is currently in the test phase. Another project that will be finalised before the year end is the recycling of Flat Panel Displays. It is clear that MGG focuses on Lower Austria as source for these materials. The MGG leadership therefore spoke to the Deputy Governor, responsible for environmental issues in Lower Austria, about better solutions for the future. The unbelievable abundance of norms, limit values and regulations as well as the loss of recyclable waste due to illegal exports of end-of-life vehicles or waste electrical and electronic equipment were discussed.